It’s that time of year again and one of my favorite educational red wine events is back. Every year I think the Paso Robles Cab Collective (PRCC) Cabs of Distinction, can’t get better and every year I’m wrong! This year actually blew my mind. 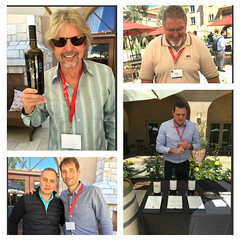 This year though it was a smaller, more intimate event and held at the new and stunningly beautiful Allegretto Vineyard Resort in Paso Robles. Aside from the En Primeur & Current Vintage Tasting there were 3 separate seminars. The first “The other Cabernet” a discussion on Cab Franc was hosted by CIA instructor and Master Sommelier Bob Bath, the second “Know Your Cab Clones” about the clonal varieties and the third and final which was the real mind blower was the “Judgement of Paso” a play on the 1976 Judgement of Paris wine tasting. 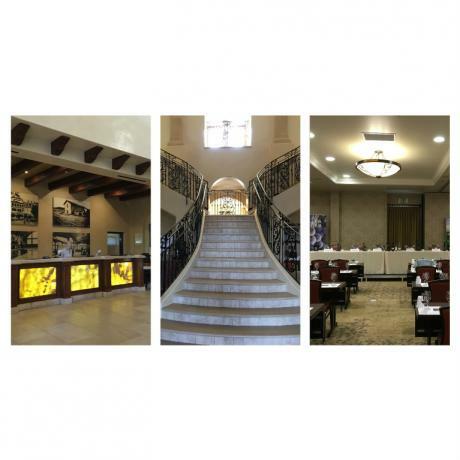 We (my friend Laura and I) arrived at the property and were ushered out to the courtyard where all the winery participants were set up alphabetically from Adelaida to Vina Robles for the En Primeur tasting. Which not only includes the current on the shelves releases, but also barrel samples of the upcoming 2015 releases. Because we only had 2 hours to taste before our first seminar, unfortunately I didn’t have a chance to taste with everyone. Once the En Primeur ended we went into “The Other Cabernet” seminar with a great vintner panel consisting of Jeremy Weintroub of Adelada Cellars, Anthony Riboli of San Antonio Winery, Michael Mooney of Chateau Margene and Damian Grindley of Breacon Estates; which was fascinating. They explained that because they aren’t “handcuffed” to specific viticulture styles, different farming techniques allow for a riper style of wine, particularly because the berries of Cab Franc are more versatile. Additionally Michael said he is very proud of his Cab Franc because as a result of having contracted red blotch, it created “uberVines” and it’s a “real showboater”. 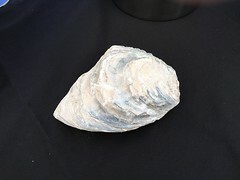 Though similar in size, teeny tiny but a bit larger than Cabernet Sauvignon as a result of shatter, cluster sizes recently have been less tight than usual. Comparing the two, Cab Franc has a thinner skin and is not as rich in color; while also producing lower tannins and more floral notes. Cab Franc is also harvested earlier than the Cab Sauv. because it ripens earlier. As much as I love Cab Franc it’s not typically my go to wine, so this seminar was a great opportunity to remind myself of what an amazing varietal it is, how under utilized it is and how many great local wineries produce it. The upside is if it’s marketed correctly, and people are reminded of how delicious and versatile it is, it could be the next big trend in wine; so keep an eye out and let’s help this Noble grand parent of Cabernet Sauvignon back into the mainstream market. 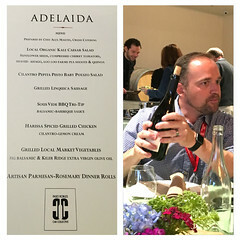 Because of Cab Franc’s versatility in food pairing each wine maker was asked what they’d pair the wine with; Jeremy felt that the wine tends to be more feminine and likes it with Duck Confit and meals with ingredients like duck, poultry, and steak. Damien said it was great with Vindaloo, Anthony likes it with Cassoulette and Lamb and Michael likes it with a Beef Burger and red sauces. Following the day’s events Adelaida hosted a phenomenal catered barbecue at the new winery and tasting room (which is just gorgeous). Arriving at the winery we were greeted with all the wines left from the En Premeur which was great, because some of the wines I didn’t have a chance to taste at the event, I was able to taste at the BBQ. Our dinner menu for the evening was a buffet of Local Organic Kale Salad; Cilantro Pepita Baby Potato Salad; Grilled Linguica Sausage; Sous Vide BBQ Tri Tip; Harissa Spiced Grilled Chicken; Grilled Local Market Vegetables; and Artisan Parmesan-Rosemary Dinner Rolls. It was a great night with lots of wonderful people, wine and conversation. The next morning we were back for the “Know your Cab Clones” seminar hosted by contributing editor of Wine Enthusiast and senior editor of Santa Barbara Independent, Matt Kettmann. All the wines tasted during this event were picked in a blind tasting. The panel consisted of Sterling Kragten of Cass Winery who uses the clone 8 (from the Geneseo District which is planted with 70 acres of 4 different Cab clones) for his 2014 Cab Sauv. Anthony Riboli said his Clone 337 had gotten leaf roll and once it was cleaned up it became clone 47. Since it’s a high producing clone there is a need to drop crop for consistency and quality. It is very high in tannin, with dark raspberry, cherry, and vegetative qualities. The clone has proven itself in Paso very well. Kevin Willenborg of Vino Robles felt that because Paso has very calcareous soil it was necessary to combine 3 different vineferas (Texas, the Midwest (for its drought tolerance), and one from wetter regions), to match rootstock to soil conditions. That way all 3 can be crossed in various ways to make it conducive to the area of growth. Steve Peck of J. Lohr said clones are about steering away from viruses. Clone 33 is one of the of the hottest clones out there, but it started out as a virused clone 191. The entire concept of clones was to create mutated vines that can resist and fight virus and disease through a natural genetic modification process. This also results in them having certain attributes that are influential when it comes to choosing which ones will be used to make the blend. Each clone advances the health and thus quality of the grape and it’s aspects, to make better more complex wine from the same varietal. Clone 6 had really low yields last year because 2015 was a rough year for yield but in general the most reliable clone is 169. The winemaker for example, can extract more tannin from 169, so (s)he would have to keep an eye on it and may pull it off the skins a bit earlier than with other clones. Clone 337 is considered a work horse because it offers a more fruitful yield and creates a more earthy, herbaceous quality to the wine. Clone 337 historically it is thought to have originated from Chateau Margaux one of the great first growths of Bordeaux. Then it was time for the event de resistance! 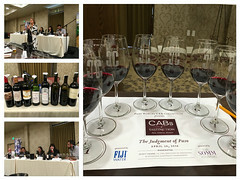 Initially I didn’t think I’d be able to attend the Judgement of Paso event. It was very exclusive and very full, but thankfully I got a last-minute email invitation to attend. Boy am I glad I didn’t miss it! Moderated by Certified Sommelier Scott Young of Blackhouse Hospitality Management. and a panel of 6 Sommeliers. The entire concept was to do a blind tasting of 2012 Cabs: 2 Bordeaux, 3 Napa/Sonoma, and 3 Paso; and then figure out if we could tell which ones came from where. Because of chatty ladies behind me, I missed hearing the actual explanation of what we were doing so I’m not going to tell you what I “scored” but the upshot was as a result, I had no preconceived ideas or thoughts on the wines going into the tasting. We were given about 5-10 minutes to do our own versions of deductive tasting to try each wine and make our conclusions as to what country and region they are from. Once everyone was done on their own, it was time for discussion and bottle reveals. The first bottle revealed was The Farm LPF grown on Paso’s west side, in the Adelaida District. Numbers 2 and 4 were the old world Cabs from Bordeaux, 2012 Pichon Longueville Baron from the left bank Pauillac appellation and the 2012 Chateau Lascombes from the Margaux appellation on the right bank. Both wines were clearly old world with the thinner viscosity and dank earth qualities they are known for but the Chateau Lascombes had a really strong horse blanket mustiness going on. The other Paso cabs were: #5 Daou’s Soul of the Lion also from the Adelaida District and #7 from Calcareous which was the ringer; their inaugural release of this Signature D Cabernet Sauvignon is off the hook! Partially fermented and fully aged in 100% new French Orion and Cavin oak with medium plus toasted barrels for 30 months the wine is unfined and was not racked. This created a HUGE wine with complex flavors of mint and eucalyptus, black fruit, dark chocolate and licorice with nice round tannins. It really is a must try and to boot, hardly anyone guessed it was a Paso wine. The Napa wines were #3 Mondavi’s Continuum Proprietary Red, #6 was a Chappellet Cabernet Pritchard Hill, and lastly #8 a Pahlmeyer Proprietary Red . All the wines were incredible and while all the same base grape varietal, they were very different wines. The general take away was that the Paso wines stood up to every other wine and in fact several were thought to have been from Napa, so not only did Paso Cabs make the bar, they exceeded it. The thing I personally took away was that in a blind comparison between the three, French Cabs are much “dirtier” earthy and dank while Paso has a lot more fruit forward qualities and Napa, it fits squarely in the middle combining both dank earthiness with juicy fruit qualities. As I said this was an anchor event for me, and if you attend the Cabs of Distinction next year an absolute do not miss, should they do it again. 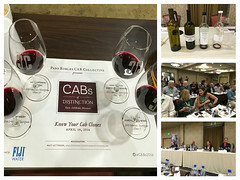 Once again The Cab Collective in conjunction with Somm Journal, The Tasting Panel, and Parker Sanpei PR blew it out of the water with another phenomenal year of great Cabs and a wonderfully educational event for both public and industry alike.